In my book, a Sunday lunch is a few sandwiches short of a picnic without good old roast potatoes. They have to be crispy, they have to have a fluffy middle, and they have to be well seasoned. A soggy roast spud is as dreary as a thunderstorm on a camping holiday. 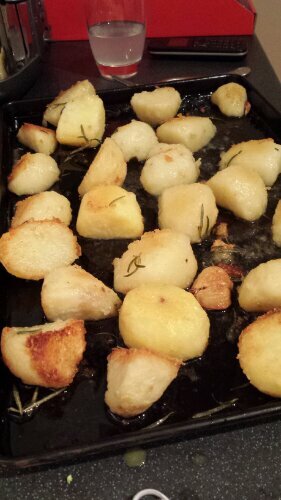 Come on people, there is no reason for bad roasties when it’s as easy as boil, oil, roast. Here’s how I do it. Firstly you need the right spuds. Maris Piper/King Edwards are what I’d usually go for and if they’ve been hanging around the bottom of the cupboard for a while even better. 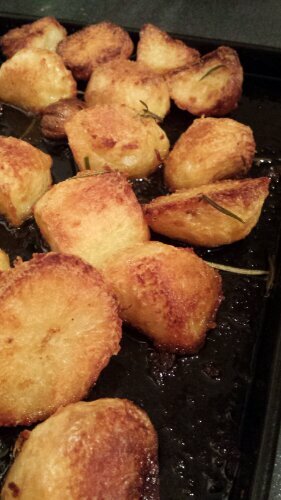 Old potatoes make brilliant roasties. Peel, chop and then par-boil. Heard it all before yes? Now, this is where things might begin to change slightly from what you’re used to. 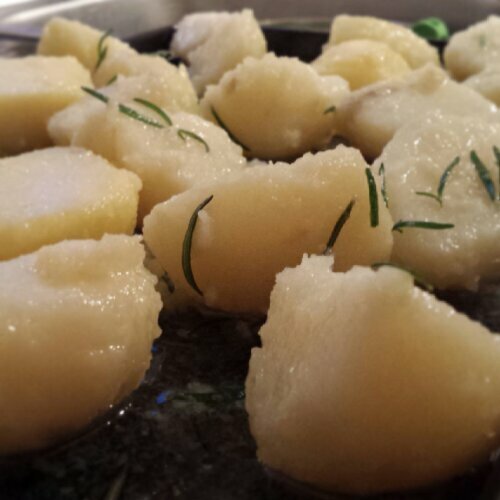 Drain the potatoes and leave them in the colander for a few minutes to dry. While they’re drying, pour some vegetable oil (goose/duck fat is even better but I didn’t have any in) into the saucepan you used to boil the spuds (make sure it’s dry when you add the oil, obviously). 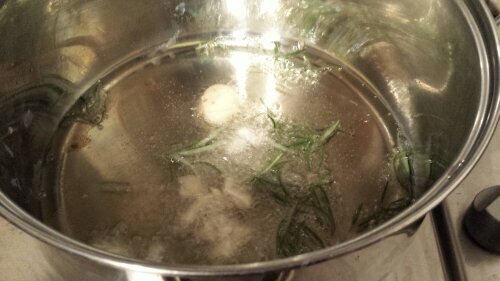 Let it heat up then throw in some fresh rosemary and a couple of cloves of smashed up garlic. 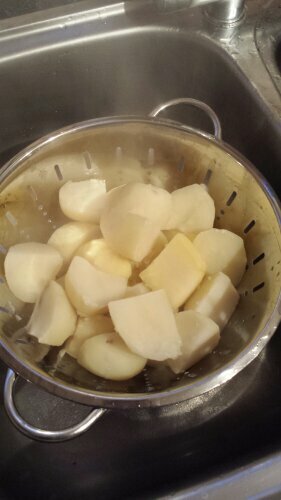 Immediately add the potatoes, put the lid on the pan, and shake vigorously to coat the spuds in the herb scented oil and rough up the edges. For goodness sake make sure it’s a tight fitting pan lid before you start shaking hot oil around! Carefully empty the contents of the pan onto a baking tray, grind some salt over them, and put in a preheated oven at about 180oC. Take out of the oven after about half an hour and give them a quick turn. Carry on cooking until they’re as crunchy and golden as you want them. Mine were in for about an hour twenty. Beautiful.